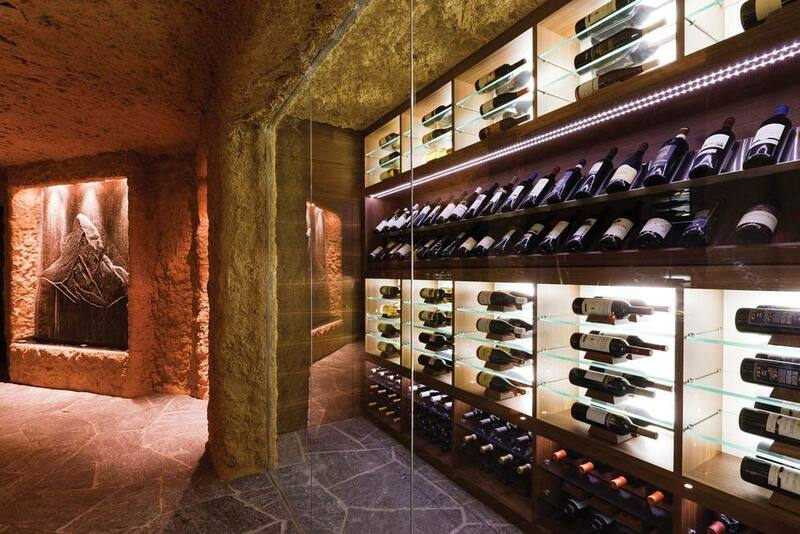 Tunnelled into the rock and lit with torches, live out your own Bond film as you enter this one of a kind luxury chalet. MLS Architekten (mooser. lauber. 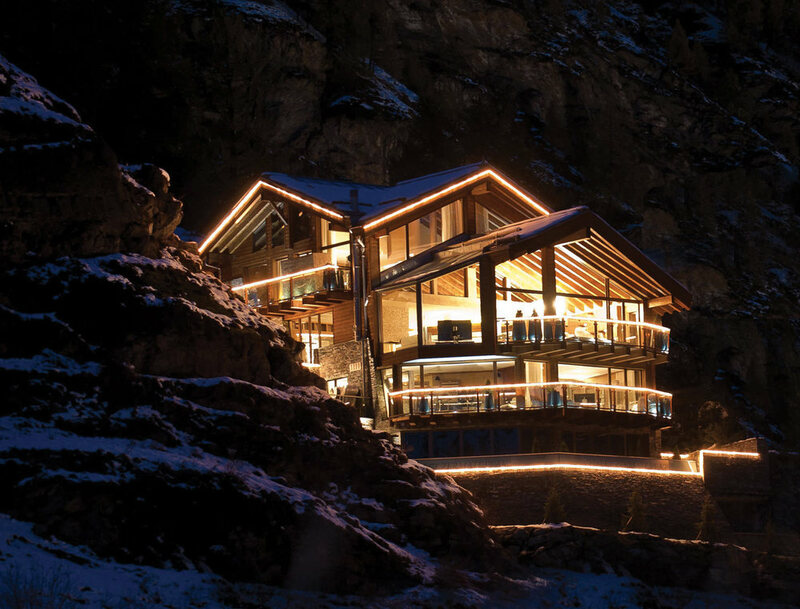 stucky architekten SIA AG) dynamited 3000m³ of rock face to create a base into the mountainside in which this 685m² luxury chalet covers five floors with large external terraces overlooking exceptional views of Zermatt and to the iconic Matterhorn. Floor-to-ceiling glass windows surround a vast open plan kitchen, dining and lounge area with double height roof and exposed timber beams. 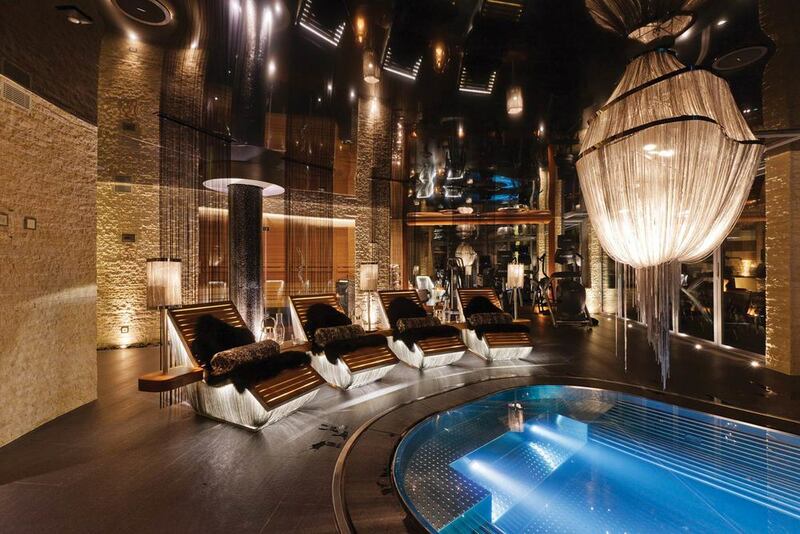 Another floor hosts a large private wellness area decorated with stone and quartz crystal, featuring a Jacuzzi, Finnish & Swedish sauna, a steam room, gym and massage area. This area is also decorated with an amazing 9.5km of hand-hung chain. Every bed, table, chair, bar stool, wall, floor and ceiling light have been carefully designed and hand-built. The furnishings and finishing touches throughout the chalet are superb, with walnut floors, high grade stainless steel and chain work, Murano & Swarovski crystals, Brazilian marble, Italian granite, American teak and redwood, specially created plaster works and high grade selected leather. This exclusive chalet is suited only for those who settle for nothing but the best, providing the highest specifications combined with exceptional design, bespoke service and attention to detail. With large entertaining spaces, this chalet is perfect for a celebration and to dine in alpine style. If requesting a property, please give the number of bedrooms required, number of adults (+ children with their ages), any idea of dates and approx. budget.